Have 2 eeros and it runsnat the same speed as it did without them throughout the house...anyone else getting no results. btw, 2100 sq/ft house. I'm using 3 Eeros in 2100 square foot house, which greatly reduces the distance between Eeros. Big speed increase and no more dead spots or connectivity problems. Here are my results: 3200 sq/ft house, 2 eeros (one is on the ground floor, the 2nd is directly above it on the second floor). Each Eero has a maximum range of about 1,000 square feet, with walls, pipes in walls/ceilings, building materials, etc, all reducing that range. That's why Eero recommends 3-4 Eeros in a 2,000-4,000 square foot house, not 2 Eeros as in your set-up. Luma, Ubiquiti, Netgear, and Google all make same recommendations with their mesh networking systems. I have a roughly 2100 square foot house, with 3 Eeros. I average 742 Mbps with my Western Digital MyCloudMirror Network Access Storage up to 130 feet from my house. My NAS is connected via Ethernet to a Eero. How is your Time Capsule connected to your network - wifi or Ethernet? I have four (4) eeros for a 2100 square foot single story house with well over 20 items connected (had three eeros and just added one more eero from black friday.) Wifi and connected items are working great. I really like the new True Mesh (software update 2.0) and look forward to more features with respect to measuring connectivity and performance. Current Speed test. The version 2.0 upgrade upped my download speed quite a bit. Thanks for reaching out. It's great to hear how awesome your eero experience has been so far! I was curious what else you were looking to check? Happy to help you find it or pass along the feedback to our team! Ya, I returned mine. It wasn't consistent and didn't improve any of the areas in my house. I'm sorry to hear you decided to return your eeros, Bixbysbro . If you ever look to give eero another shot, please feel free to contact our support team. We're more than happy to work with you on placement and anything else to ensure you get the most out of your eero WiFi system. Jeff C. Well.. I just found another thread about Apple devices. I had a 6s and changed to the 7 when I changed carriers. I didn't notice issues before the swap, but I have only been running the Eeros a short time. After reading that post, I am guessing my issues may be related to the apple iOS device. My older Apple TV was also having some issues connecting or allowing me to use Airplay from the phone. I was static in the living room and not roaming. I unplugged 1 of the 3 Eeros and it seemed to connect better, but the videos were super choppy. I reset both devices as mentioned and it seemed to run fine for a short time and then started again. My MacBook 12" seems to do fine. I have several smart devices in the home (4 Kuna Camera lights, Ecobee Thermostat, Wink Hub, Chamberlain MyQ) on top of the various devices for 5 people with phones, laptops and tablets as well as the Smart TVs and cable boxes, etc... I was just trying to find a better way to determine which devices connected to the Eeros may be using the most bandwidth or if it is truly the Apple devices. Side note: The setup of the equipment was super easy. I have changed out my router and modem on numerous occasions over the years. I set this to use the same SSID as the old router. *after unplugging and powering off the old router. I was running a 2.4 SSID and a 5 SSID, so I did have to reconfigure a few devices to use the same SSID. Overall, it was up and running very quickly. I may try to adjust placements of the units, but I do not have coverage issues in the 2638 sq ft home. My wife is not complaining about losing connection on her laptop any longer. bbrinks I do not use WPS at home. It has been awhile since I setup the My Q. Pretty sure I had the phone on my WiFi and connected to the MyQ hub with Bluetooth. I do not recall if I entered the info or it took it from my phone settings. Eero can't provide more speed than is provided by your ISP. If you max at 50mbps download, that's the max you could receive. I have a complex home network and it has never run any better. SmartHomeTN21 How old is your Apple TV? Some of the older models had problems with AirPlay. Have you also tried resetting your iPhone 7's network settings, Settings>General>Reset>Reset Network Settings? Richard1864 No. I didn't think to do that. Good idea though since we did a restore from the 6s backup. I'll try the network reset to see how it goes. The Apple TV is Gen3, A1427. Pretty sure the phone is the issue though. It did better from the laptop. I also hardwired it to the Eero to test how that would go. It refused to connect to anything with the one in the living room plugged in. I am going to see about moving the locations around to see if that helps as well. I may try tonight after I get home from work. SmartHomeTN21 I had the same issue with my iPhone 7, after also restoring from an iPhone 6s Plus. I suspect it's caused by the iPhone 7 having newer 802.11ac 2nd generation networking, and the networking settings from the older iPhone(s) aren't compatible with the newer networking protocols. Unplugging the power cord from the Apple TV for a minute or two may also help. Or resetting the Apple TV may help it connect via wifi to Eero. I pay for 100 mbps and roughly get 60 down when I'm next to the modem. in my room where I had a eero I was getting maybe 30. Bixbysbro did you turn your modem off, then connect Eero, turn the modem on after connecting Eero, and then plug Eero in for power after your modem finished booting up? Bixbysbro, not sure what kind of modem. It may need reset!or firmware update. Or you may just be in a highly populated area of cable users. SmartHomeTN21 glad the network reset worked. Anything else Incan help with? Richard1864 good for now. thanks for the tip. Mbps down, 5 Mbps up service to my home. Short version: Based on speed tests by eero and testmy.net my network's upload speed is not operating to capacity. However, speed tests from my ISP and speedtest.net indicate my network's upload speed is just fine. Long version: A couple of weeks ago the results of eero daily speed tests changed. The download speed remained as expected, about 30 Mbps but, upload speed was reduced from 5 Mbps to 1 Mbps. I performed a speed test from Safari on Mac mini pointed at testmy.net and its results matched those from the eero app. I also launched Safari on my iOS devices -- while connected to home wifi -- and performed the same tests. The results also matched those from the eero app. I called my ISP and requested a reset signal be sent to my cable modem. Ran the speed tests again on all devices ...no change. I unplugged both eero devices, then reconnected them to power. Ran the speed tests again ...no change. Next, I ran a speed test from Apple TV. Since there is no web browser on Apple TV I used an app: Speedtest by Ookla. This time my upload speed was good ...around 5 Mbps. Download speed was around 30 Mbps ...also good. To be thorough, I also speed tested my iOS devices using the Speedtest app ...again 30 down, 5 up. And finally, on my Mac mini in a web browser pointed to speedtest.net ...all good, 30 down, 5 up. As a final step, I retested my iOS devices and Mac mini with their browsers aimed at testmy.net ...not good, 30 down, 1 up. These numbers match what I continue to see in the eero daily speed tests. My question: Who is right? On one side, my ISP and Speedtest.net say everything's working great. One the other side, eero and testMy.net say my upload speed is not working as advertised. Thanks for sharing the process you took for checking speeds. Generally, we suggest using a product like speedtest.net or MLab if you want to double check your speeds. 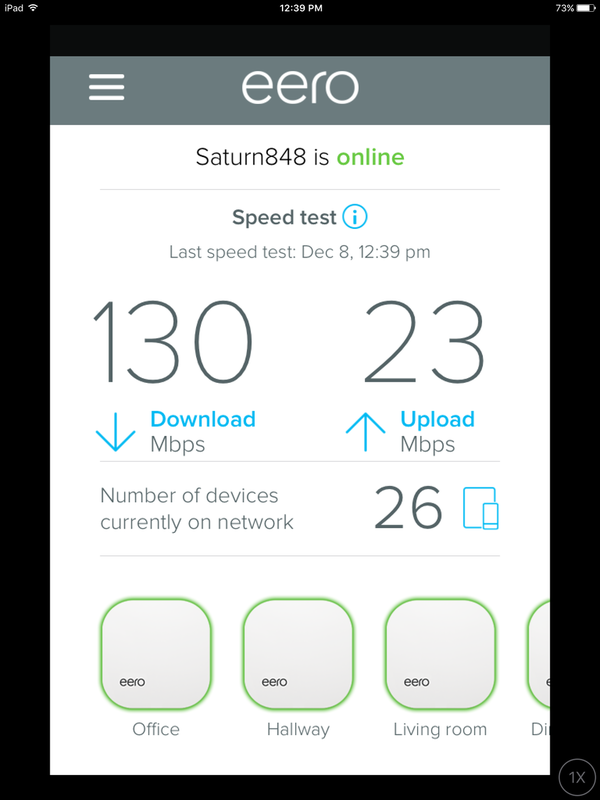 If you see a discrepancy from the speeds shown from these tests versus what you see in the eero app, please file a ticket with our support team so we can investigate. Generally, the external tests are pretty accurate and shouldn't inflate your numbers. If the issue persists, feel free to give us a call at 1-877-659-2347 or email us at support@eero.com. When posting numbers and comparing against other devices remember to check which band you are testing through. The numbers by themselves, even side by side with another product don't really paint a full picture. In many cases when testing against the eero, there can be huge discrepancies if testing against a 5Ghz router and you connect to the 2.4Ghz on the eero. There are very few situation where the 2.4Ghz will win out over 5Ghz, and the margin will typically be massive. I think this simplicity is really muddying the waters for people that don't understand the difference. The 2nd crtiteria that is being overlooked is how each network responds when there are more than one device active. Let's say you have a bunch of different technologies all over your house with a total of 40 wireless devices. In this environment you have a couple of people consuming streaming services, websites and various other media. Multiple units (in larger areas) will certainly handle this better than one centralized device. When doing an eero speed test using the app on my mobile device, I'm not actually testing "Wi-Fi speed" but the hardwired connection between my primary eero device and my ISP, right?